In November 2005, One Stop Environmental launched a multifaceted response to Hurricane Katrina. OSE was a first responder for a national railroad company, providing vacuum trucks, heavy equipment and environmental technicians to bring their main rail yard back to a functioning state. OSE also performed facility dewatering, hazardous material identification and disposal and asbestos/mold abatement for the railroad. OSE was also awarded a contract to remove household hazardous waste from residential areas of St. Bernard Parish. Our responsibilities included remediation services, identifying waste and testing unknown waste samples, transportation of waste, storage of waste, oversight of hazardous and potentially hazardous waste, air sampling and a wide variety of other environmental tasks. 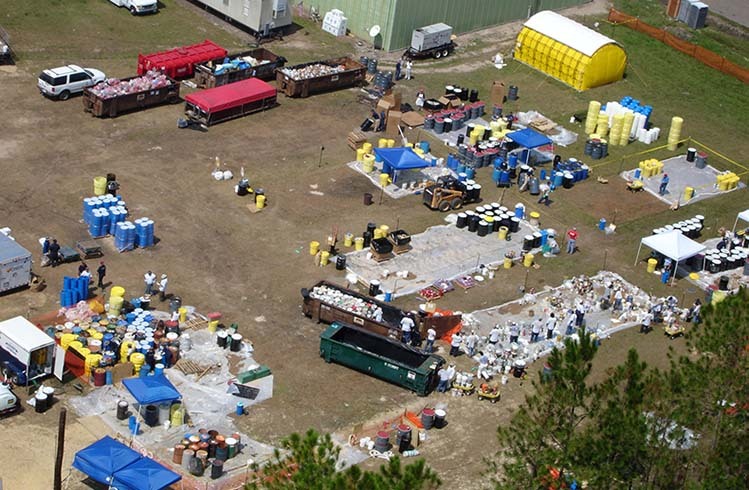 OSE also supported the US Department of Agriculture in their emergency watershed protection (EWP) program following Hurricane Katrina. OSE cleared hundreds of miles of live streams and waterways in southern Louisiana that had hundreds of thousands of pounds of vegetative debris blocking water flow. OSE removed debris, performed bank stabilization and repair and stream/wetland restoration.